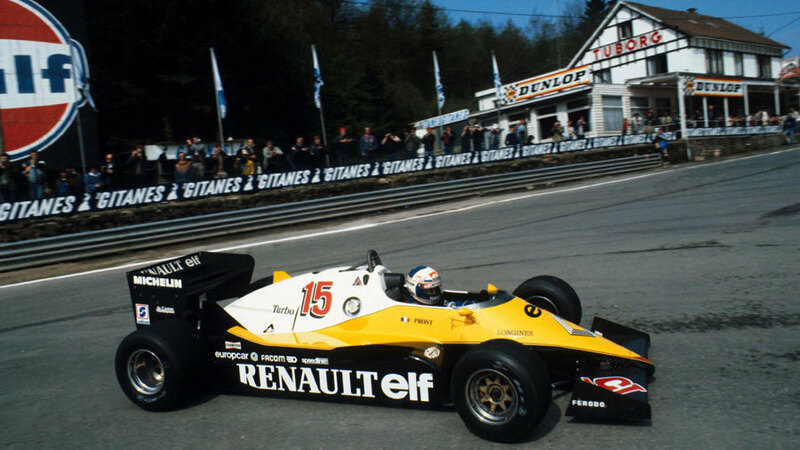 After an absence of 13 years, the Belgian Grand Prix returned to Spa-Francorchamps and Alain Prost was the man who came away with a win for Renault and in so doing moved to the top of the drivers' championship. After a false start had caused the race to be cut from 42 to 40 laps, Prost, on pole alongside the Ferrari of Patrick Tambay, was twice surprised by a bold move from Andrea de Cesaris who squeezed his Alfa Romeo between the leaders off the line on both the original and re-started races. He held the lead until a poor pit stop, which took about ten seconds too long, dropped him to third, and he later dropped out with engine trouble. Prost, whose Renault team was mastering quick stops, then eased into a lead he held for the rest of the afternoon. Nelson Piquet's Brabham was doing the chasing but he lost fifth gear near the end and on such a power circuit fell down the order and limped home in fourth. That allowed Tambay to secure second with the second Renault of Eddie Cheever third. John Watson's afternoon ended when he collided with Jean-Pierre Jarier's Ligier at the hairpin, while Manfred Winkelhock had a lucky escape when his ATS lost a wheel in a high-speed double curve and he crashed into catch fencing. Keke Rosberg, who came fifth, was hit in the visor by a stone on the opening lap. The result left Prost heading the championship by four points from Piquet who was one ahead of Tambay.